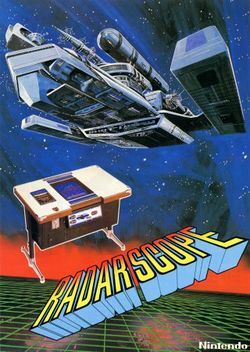 Radar Scope is an early arcade game designed by Nintendo, developed by Ikegami Tsushinki and released by Nintendo in November, 1980. 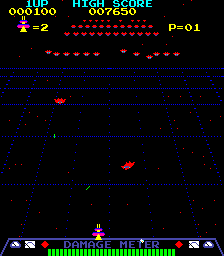 It is a shooter that can be viewed as a cross between Taito's Space Invaders and Namco's Galaxian. It was released in three types of arcade cabinets: Up-right, Cockpit and Cocktail. Contrary to popular belief, this is not Nintendo's first arcade game. Prior games include Computer Othello (released only in Japan), Sheriff (released in the U.S. by Exidy as Bandido), Space Fever (released only in Japan), and Space Firebird (released by Nintendo and Gremlin Industries in the U.S.). Radar Scope was also known as the first game Shigeru Miyamoto helped develop. He was later given the task of creating a game using Radar Scope's engine, the resulting game was Donkey Kong (Which the character Mario came from) which become a Worldwide phenomenon and helped put Miyamoto on the path to becoming one of the most celebrated video game designers of all time. It also brought Nintendo one step closer to developing their first cartridge-based home console, the Famicom (known as the Nintendo Entertainment System outside of Japan). As captain of the Sonic Spaceport, players must defend their station against enemy spaceships called Gamma Raiders, which attack with vengeance and swiftly retreat to formation. The object of the game is to destroy 48 enemy Gamma Raiders before there is total disintegration of all the Spaceports on the player's side. Players can counterattack with the Rapid-Fire Laser Blaster which zooms the lasers over the three-dimensional-esque field of curving vectors, while it intercepts enemies. The lower on the radar screen that you destroy a Gamma Raider, the more points will be earned. If exploding decoys damage the Sonic Spaceport, the Laser Blaster's firing speed will reduce. The Laser Blaster's "Damage Meter" will light up as damage is incurred and when fully illuminated, will weaken the Laser Blaster's offensive powers. To reverse this, the players must attack and destroy all remaining Gamma Raiders. Players are given a wide range of flexibility in controlling the difficulty levels of the game. Extra Spaceports are awarded at 7,000, 10,000, 15,000 and 20,000 points, as determined by the players. The initial number of Spaceports may also be pre-programmed at 3, 4, 5 or 6. When the required number of spaceships is destroyed, players receive an extra point bonus. The game was popular for a short period in Japan, so the president of newly-founded Nintendo of America, Minoru Arakawa, placed a large order for it. By the time the game arrived in New York, months had passed and the buzz surrounding the game had dissipated. The game's sounds were high pitched chirps which many gamers found annoying. American arcade operators were unimpressed, and Nintendo of America was stuck with thousands of unsold units sitting in the warehouse. Arakawa faced financial disaster, so he pleaded with his father-in-law (Nintendo CEO Hiroshi Yamauchi) to provide him with a new game which he could install as a replacement in the Radar Scope arcade machines, which could be repainted to reflect a new game. Yamauchi assigned the game's designer, Shigeru Miyamoto, the task of "fixing" the game so it would appeal to gamers. Rather than tweak a poor game, Miyamoto designed an entirely new game, Donkey Kong, using the Radar Scope hardware. Out of the 3000 arcade units originally manufactured, around 2000 were converted to Donkey Kong. The converted units can be spotted by their red cabinets. Conversion kits for the new game were then shipped to North America, where Donkey Kong went on to become a huge success. As a result, Nintendo established itself as a powerhouse in the North American video game market. This page was last edited on 4 December 2009, at 00:09.